2017 In A Sentence: The Camels finished their final year in the Pioneer Football League with a successful 6-5 record, even if the 45-10 season-ending loss to Drake was a disappointment. Biggest Shoes to Fill: SS Carlos Merritt was second on the team in tackles (94) and notched 6 interceptions on the season. He’ll be tough to replace in the middle of the secondary. Key Player: Don’t be fooled by the fact that Campbell came from the non-scholarship Pioneer Football League, they have some young players that could make some good impact in the Big South right away. As a redshirt freshman, QB Daniel Smith had a terrific season, rushing for 12 TDs and passing for 18 more. There may be a adjustment with a slight upgrade in competition, but he seems ready for the challenge. 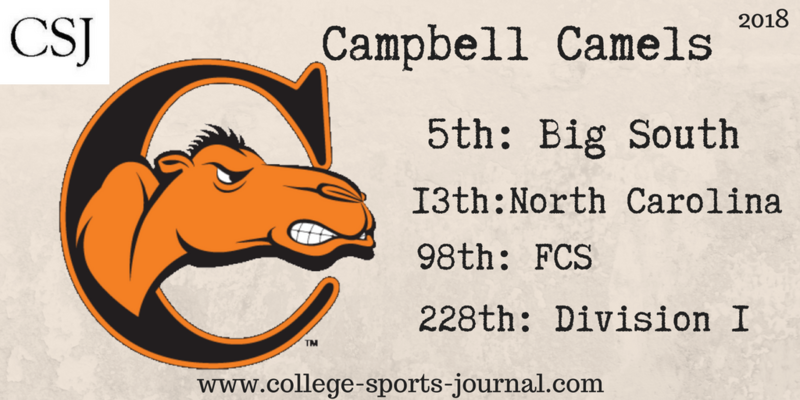 Fearless Prediction: Campbell will be hitting the ground running as they enter the Big South in football, and may surprise people by being competitive right off the bat.